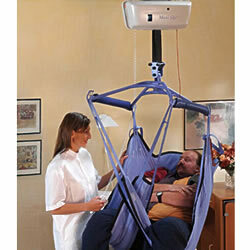 Additional bariatric designed spreader bar for the Maxi Sky 1000 ceiling lift. ArjoHuntleigh's unique bariatric designed spreader bar, which simplifies operation by the caregiver, giving the capability to handle all passive lifting situations! The unique wide space design and angle of the spreader bar attachment points, allows the individual to be lifted in a comfortable position. 1000 lb capacity.